The Commission is charged under a Bill enacted in 2016 with the responsibility of curbing corruption in the country. Thus far, however, except for the case of a former Minister and Central Committee Member of Parti Lepep, the public has not been made privy to any ongoing investigation by the Commission. In a damning video of a meeting of Mr. Wavel Ramkalawan, Leader of the Opposition with Facebook activists in England, Ramkalawan inferred that he gives orders to Ms. De Silva with regards to prioritizing disposal of cases. 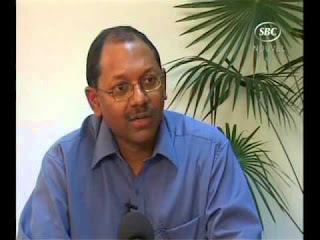 That declaration by Mr. Ramkalawan, if true, is enough reason to request the resignation of May De Silva, and seems to confirm what many have been suspecting that the Commission is now a political tool being used to witch-hunt Parti Lepep supporters and others who doesn’t see eye-to-eye with LDS. The Commission found it necessary to release a Press Communiqué regarding the supposedly fraudulent acquisition of 52 plots of land by the former Minister, but failed to make any public pronouncement on any of the other 28 investigations that Ms. De Silva claims are ongoing in her interview. It is also weird that Ms. De Silva has failed to follow up investigations on allegations of misappropriation of land by Mr. Pat Pillay and other leaders in the LDS. That Ms. De Silva also failed to investigate allegations made by Honorable Simon Gill that one government official has acquired 110 plots of land further strengthens the perception that the Commission is not impartial and therefore lacks credibility. Ms. De Silva further compromised her political independence when she proceeded to express her opinion on the state of transparency in public administration, especially the National Assembly. She averred that she was a fan of the LDS majority legislature and that the 5th Assembly was not up to standard when it came to ensuring transparency. It is obvious that the Commission’s sole objective is to get as many active Parti Lepep supporters in jail as possible, which was clearly the intention of the Today in Seychelles journalist questioning May De Silva. We sincerely hope that Ms. De Silva will not succumb to pressure to publicly punish a group of people perceived as having political opinion different from hers or that of Wavel Ramkalawan. In the meantime, we would advise the CEO of the Anti – Corruption Commission to give fewer interviews and to concentrate more on bringing culprits to justice irrespective of their political belief; Parti Lepep, LDS and non-partisan individuals who have involved themselves in corruptive activities against people and country.